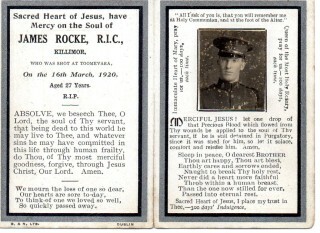 The murder of the officers, James Rocke and Charles Healy, caused widespread revulsion and immense sadness, among their families and friends. The Nenagh Guardian of Saturday, 20th March, 1920, paints a vivid picture of the fatal attack. Constables Rocke and Healy were both returning to their barracks, after Novena Devotions on St. Patrick’s evening, when shots rang out. Constable Rocke fell immediately and lay on the ground mortally wounded. Constable Healy was hit in the back but regained sufficient strength to reach the barracks, one hundred and twenty yards away, to summon help. A doctor, two priests and the station sergeant ran to his aid, and got him to the barracks, where he died at 11.15pm, four hours after being shot. His dying words, according to evidence given at the inquest by his sergeant, were ‘I forgive the men that shot me and anything I have I leave to my mother’. Constable Healy also succumbed to his wounds, and died later in a Limerick military hospital. Constable James Rocke was twenty seven years of age and unmarried. 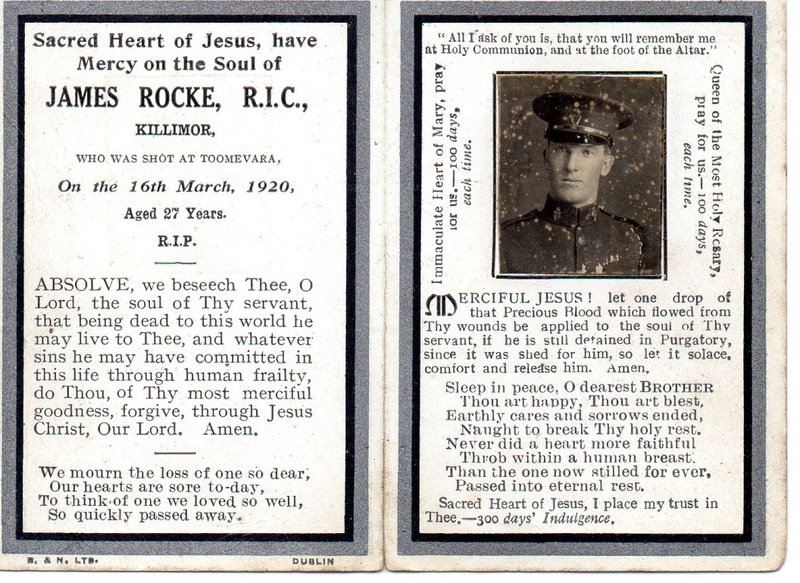 He had about seven years service in the RIC, and was stationed in Toomevara only since 23rd February, 1920, having previously served in Borrisoleigh. He was survived by his widowed mother, Bridget (née Finnerty from Eskerboy, Kiltormer) and his six brothers, Pat (Lurgan), John (the forge, Lurgan), Tom (Derrew), Andy (the shop beyond the forge), Frank, who also died at a young age, and Mick, who served for some years with the American army, during the 1914/1918 war. James’s brothers and a cousin arrived by car in Toomevara after the inquest into his death, and took his remains to Killimore. He was interred in the family plot in Kiltormer cemetery. His nearest relatives now residing in the Killimor area are his nephews, grand-nephews and grand-niece. On 15th May, 2008, RTE 1 broadcast a programme “Flesh and Blood” detailing the life of journalist Brendan Lynch and his brother, who were originally from Toomevara. They laid a wreath at the site of the shooting of the two RIC officers. For further information see: Killimor – Our parish and our People, published by Killimor and District Development Society, on sale only through killimorheritage@eircom.net, or telephone: 090 – 9676565.